Phytelligence, an agricultural biotechnology company with Washington State University roots, has established its headquarters in Seattle and facilities in Seattle and Portland for advanced propagation of food crops. The company was founded in 2012 by Amit Dhingra, associate professor of horticultural genomics and biotechnology at WSU. He developed micropropagation protocols, techniques and software to produce rootstocks, fruit trees and grapevines faster and cheaper than traditional nursery methods and ensure their correct identity through high-resolution genetic fingerprinting. Disease screening, plant repository services, securing of intellectual property and the ability to co-develop new varieties of food crops also is provided. The company has biological and compound solutions, including one that keeps pears from aging after they are sliced and packaged. 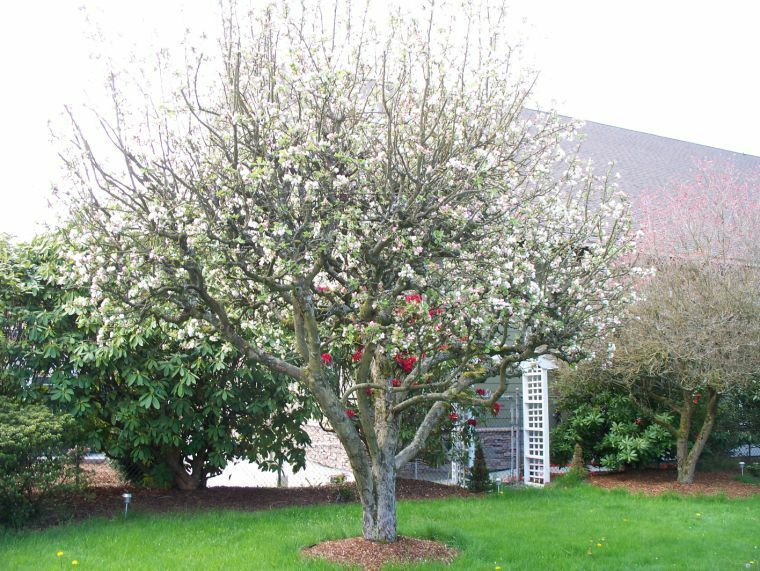 In 2012 and 2013, mix-ups in materials for propagation of new disease-resistant apple rootstock at Washington tree fruit nurseries led to the loss of millions of dollars, Dhingra has said. Phytelligence can prevent that by testing the DNA of each plant, he said. 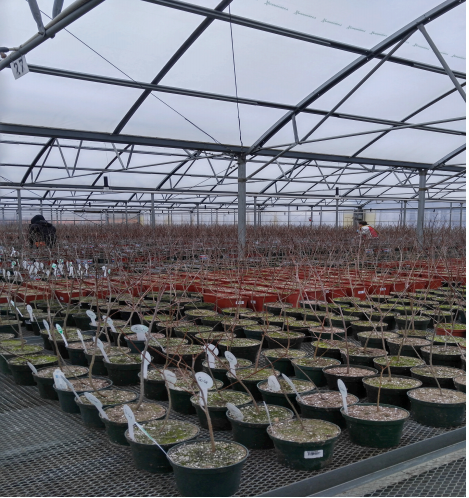 The goal is not to replace Northwest fruit tree nurseries but help them become more efficient, cost effective and globally competitive, said Ashley Ennis, Phytelligence director of marketing. C&O Nursery, Wenatchee; Van Well Nursery, East Wenatchee; Willow Drive Nursery, Ephrata; TRECO, Woodburn, Ore.; and ProTree Nursery, Brentwood, Calif., all have invested in Phytelligence. They remain supportive, Ennis said. Dhingra is the company’s controlling partner, handles scientific developments and operates its Pullman laboratory, she said. The company has expanded into production of pear and cherry trees, peaches, almonds, hops and blueberry, raspberry and strawberry plants, she said. Seattle facilities provide 118,000 square feet of greenhouse and 85,000 square feet of outdoor storage to meet customer demand for 3 million to 6 million plants in each of the next two years. More than 15,000 plantlets already arrive weekly from the company’s tissue culture laboratory in Pullman. The Seattle facility has a state-of-the-art, high humidity growth and acclimation building to transition plants from the tissue culture gel composition to the sterile greenhouse potting environment. In Portland, Phytelligence recently moved into the 12,000-square-foot PacTrust facility adjacent to the Oregon Business Park. It includes former facilities of Dow AgroSciences and will retain most of that company’s researchers for studying production and use of plants for food, fuel, fiber and land reclamation. 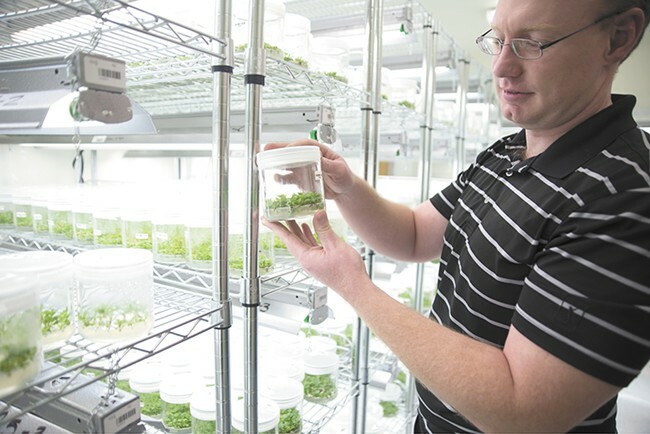 There is a tissue culture lab and plans to eventually grow up to 29 million plants annually. Phytelligence (http://www.phytelligence.com), a platform agricultural biotechnology company that is revolutionizing the way food crops are grown, today announced the official establishment of their Seattle headquarters, and the extension of the company to Portland, Oregon. The expansion highlights new growth for the company, which was founded in 2012 and born in Dr. Amit Dhingra’s horticulture research lab at Washington State University. The Seattle headquarters provide Phytelligence 118,000 square feet of greenhouse space and 85,000 square feet of outdoor storage to meet customer demand for 3-6 million plants in each of the next two years. More than 15,000 plantlets already arrive weekly from the company’s tissue culture laboratory in Pullman, Washington. The furnished facility, including delivery trucks, has a state-of-the-art, high humidity growth and acclimation building serving to help transition plants from the tissue culture gel composition to the sterile greenhouse potting environment. Matching capabilities – Formerly used by Dow AgroSciences for studying the production and use of plants for food, fuel, fiber, and land reclamation. Skilled workforce – Phytelligence will retain most of Dow AgroScience’s Portland-based former researchers and use the facility in much the same manner. Room to grow – Phytelligence is planning an expansion that can accommodate a total production of up to 29 million plants every year. James Jackson is ready to speed things up. The 35-year apple growing veteran said he wants to add a new batch of Fuji apples to his orchard, but he’s hampered by the same factors constraining the rest of the industry — a limited supply of rootstocks for new trees and varieties. Due to a backlog of demand, plus the time it takes to grow, a new order of rootstocks can easily take up to three years to arrive, Jackson said. But a Pullman-based company has been helping the industry break through that barrier, making it possible for growers like Jackson to add new trees and varieties much sooner than he would have been able to just a few years ago. 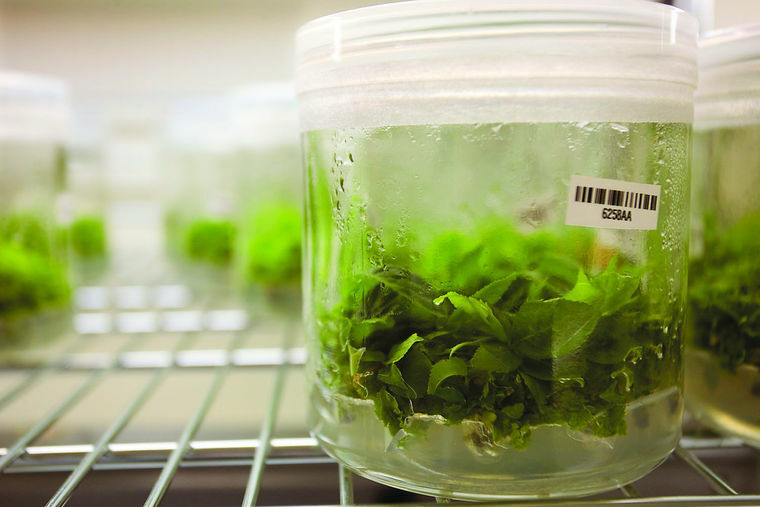 Using a process called micropropagation, Phytelligence takes small cuttings of specific plants that growers and nurseries are looking for — like the Geneva 41 rootstock Jackson has on order — and places them in a special growth medium. “It’s our ‘special sauce,’ quite literally,” said Phytelligence co-founder Dr. Tyson Koepke. Different types of growth media are used at different stages of growth, and all are closely held company secrets. The media speed up growth, which Koepke said generally provides about three- to four-fold multiplication every month. Once plants are large enough, they can then be cut into multiple different plantlets again, and the process is repeated. “So you can go from one plant to 250,000 plants in a single year,” Koepke said. Barcodes on each jar allow the plants to be tracked from beginning to end in a sterile environment, which, combined with genetic testing on the back end, provides a new level of assurance for the genetic purity of the plants. “Inside of the jar they have an almost perfect environment. They’ve got good humidity, good temperature and all the nutrients and minerals they need,” Koepke said. The process is allowing Phytelligence to supplement the nurseries that growers have typically relied on in the past for their new stock. For growers like Jackson, the speed with which he can rotate in new varieties, several times faster than nurseries can provide at a reduced cost, there lies a promise of a new industry paradigm. “Think about it — if you can get your root two to three times faster for half the price, and if that can be done consistently, that’s going to be a game changer,” Jackson said. Nurseries are limited by the amount of land available for growing new plants, Koepke said, which means every new plant in the ground takes up space where a more a more mature rootstock could be growing. Phytelligence, on the other hand, is only limited by shelf space. Koepke said they can fit 63 jars on each shelf, with about 33 plants per jar — for a total capacity of about 550,000 plants at their Pullman location — but it’s not nearly enough. Originally conceived in a research laboratory at Washington State University, Phytelligence is based out of the WSU Research and Technology Park. 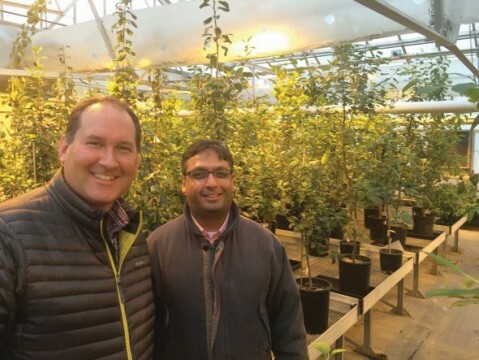 Koepke, who since growing up on a Montana farm said he has always had a goal of finding a way to help farmers, started the business with his Ph.D. advisor, associate professor Dr. Amit Dhingra, in 2011 with the goal of helping both growers and nurseries. The business didn’t take off right away, and they didn’t hire their first non-founder employee until 2013. But in just a few short years, the demand for their product has skyrocketed, and the revolution within the company has begun to mirror the change Phytelligence is leading in the industry. Koepke said they now employ about 35 people, have recently opened a new greenhouse in Seattle, and have a new laboratory in Portland coming online next month, where they will add another eight to 10 employees. As the company prepares to increase its scale of production, it has also recently added a new senior executive staff, including a new chief executive officer, chief operations officer and chief revenue officer, who together have more than 50 years of combined leadership experience, to help usher them into the next stage of the business’ development. Koepke said the long-term goal is to produce about 15 million plants per year across different species. They already offer a variety of different rootstock for apples, as well as pears, cherries and hops. They can also do raspberries, strawberries and grapes, and are looking to expand into almonds, citrus and forestry. While Phytelligence is setting the stage for a revolution in the fruit-growing industry, the most noticeable change for most, however, may well be in the fruit aisle of their grocery store. Until recently, Hemly and other growers like him had to make the best of the situation. Apple orchards covet the most productive and resilient trees, but there aren’t enough to go around. Pear growers see little research done to improve breeding in their crop. Such an innovation could bring unheard-of flexibility to some of Washington’s most bountiful crops, allowing growers to adapt sooner to consumer demands or replenish orchards ravaged by disease. They found success growing plants in solutions that Koepke describes as “jello with Flintstones vitamins for plants.” In that nutrient-rich media, one bud can multiply into 250,000 individual plants in a year. Thanks to insight from an undergraduate working in the lab, Dhingra’s team learned that its methods, if applied commercially, could relieve a longstanding bottleneck in the fruit industry. Where growers typically have to wait three to five years for new trees propagated at a nursery, these researchers invented a way to yield fruit in 12 to 18 months. Phytelligence started production in 2013. 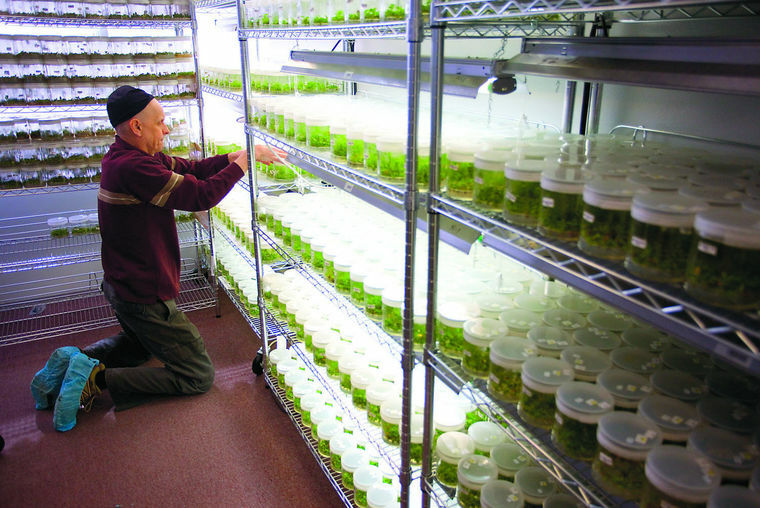 Plants, including 11 different species, grow for about four weeks in jars crowded on shelves, filling three rooms in the office at WSU’s Research and Technology Park. After a month, each plant is cut into two or three pieces, creating two or three new plants. The process continues and the numbers add up quickly. When the time is right, Phytelligence moves the plant into media that tells it to grow roots. Then it’s transported to a nursery near Seattle, where it will live in a pot until it’s 18 to 24 inches tall. The plant is a dormant stick called a rootstock, Koepke says. Once it’s planted in the ground, it can be budded in the same season, which means the grower inserts a stem with leaf buds into the rootstock. Altogether, Phytelligence shaves two years off the traditional process. “The Phytelligence approach lends itself to a lot of the concerns that have been present over the years,” says Hemly, who invested in the company. “One of the big issues in the industry has been cross-contamination. People are sold plants that aren’t what they’re supposed to be. You wait three to five years to realize the tree isn’t growing right,” Koepke says. Phytelligence genetically tests each tree. It’s the only nursery with that level of quality control. With that kind of assurance, combined with speed, Hemly feels more positive about the possibilities for his orchards. Farmers who can raise crop yields while responding to issues like climate change and water scarcity have a significant advantage. Toward that end, a Pullman firm launched in 2012 by scientists at Washington State University sells hardy plantlets it grows in a lab using “secret sauces” of nutrients. “Think of [plants in] a jar with Jell-O, with all the vitamins and nutrients they need,” says Phytelligence cofounder Tyson Koepke. The plantlets are transferred to a greenhouse, where they are grown to 18 inches and sold to nurseries. Farmers looking to plant 10 acres of apples trees might normally have to wait five years for the trees. “We can shorten that time down to about two years,” says Koepke. “Last year, we produced and delivered 110,000 plants.” By the spring of 2016, he says the company will have 500,000 plants available for farmers to buy. Phytelligence’s proprietary process, developed by WSU plant scientist Amit Dhingra and his research team, requires less than a gallon of water to grow an apple plantlet to the point at which it is ready for planting. (The conventional approach requires 50 gallons.) The resulting “smart plants” also have far higher survival rates after planting. So far, Phytelligence has sold its plants largely to in-state farmers and nurseries. In fact, two-thirds of the company’s initial round of financing came from these potential customers. A new company, Phytelligence, is poised to break the apple, cherry, and pear rootstock bottleneck. 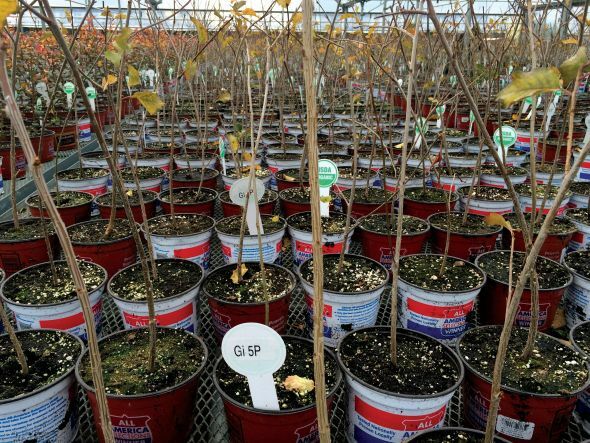 Many growers know and have experienced the long wait to get the new Geneva rootstocks from Cornell University in their hands, as well as Gisela cherry rootstocks, B.9, and true-to-type Old Home x Farmingdale pear stocks. 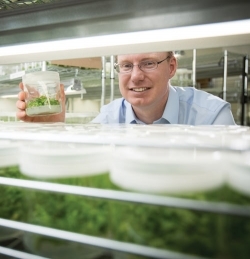 The young company, formed in 2012, has developed advanced micropropagation techniques to rapidly ramp up production of rootstocks to make them available to nurseries and growers directly. Phytelligence is a spin-off company from Washington State University (WSU), first located in a WSU research park in Pullman, WA, home to WSU. World headquarters are now located in Seattle, WA. Formed, by Dr.Aingra Dhingra and some of his former students, the company is rapidly moving forward to supply rootstocks for 2016 and beyond. In the past, it has taken up to eight years, with traditional propagation techniques to generate enough apple rootstocks to plant stool beds that grow rootstocks for the nurseries to propagate finished trees. Dhingra and his company, Phytelligence, have been able to significantly speed up this process. Another key issue for growers and nurseries alike has been getting rootstocks that are true to type. Phytelligence indicates their plants are 100% certified “genetically true-to-type.” They test and retest their plant materials throughout the micropropagation process. In fact, the company offers extensive genetic analysis services to identify unfamiliar trees in orchards or enable growers to apply the genetic analysis to file patents on new varieties. The commercial fruit industry has been strong supporters of Phytelligence. The company has raised funds from individual fruit growers, nurseries, packing houses, and others to get started. Phytelligence still has the full support of WSU, given that it is the commercial outlet for technologies developed in Dhingra’s lab. He continues to serve on the WSU faculty. Ongoing projects ranging from pear rootstock breeding, hard cider apple breeding, fruit ripening compounds, tissue culture enhancements, and advances in genomic testing were all displayed. As Amit and I have communicated, we realized we knew many of the same horticulturists all over the U.S. It’s a small world in pomology. Over the past two months I have gotten to know Dr. Dhingra, or as he really goes by to everyone — Amit! He is full of energy and has a passion for his work, helping growers solve problems. In visiting Amit’s university lab in December, I met nine of his current graduate students who enthusiastically shared their work. A unique quality of Amit is his passion for working directly with farmers. He has the true heart of an Extension worker. He began his work at WSU by visiting with farmers to identify their needs. His goal was to help solve their problems. “Working directly with the farmers to learn about their problems and solving them has been the best part of my job,” he said. As he began to solve issues with fruit production Amit indicated he was well supported by industry — not only farmers, but packing houses and nurseries. Besides micropropagation of tree fruit rootstocks and genetic analysis, Phytelligence is working on many other projects including winegrapes, raspberry, blueberry, peach, almonds, and hops propagation, all through advanced micropropagation. He began his university career at Rutgers University as a pre-doctoral student and then a post-doctoral scientist at the Waksman Institute. He then spent two years at the University of Florida as postdoc and then moved on to WSU as a faculty member in horticulture to set up a genomics and biotechnology program. Phytelligence has a great future as they have the potential to meet many of the needs of commercial tree fruit growers. As they ramp up their production of apple, cherry, peach, and pear rootstocks that are true to name, and add other services to their portfolio, growers and nurseries will be excited to work with them. Currently, greenhouses, tissue culture facilities, shipping and processing infrastructure are all in place in Seattle to service existing orders for rootstocks for 2016 and meet significant quantities of rootstock needs for 2017 and beyond. Phytelligence is able to multiply rootstocks in tissue culture three to ten times faster than standard tissue culture processes. The company also bosts less than 5% mortality of stock that are virus free and genetically certified to be true-to-type. Here’s a look at their rootstock creation process. First Stage: The rootstock material to be multiplied from tissue culture and is cut and placed in a growing medium (augar). If Phytelligence doesn’t have the desired rootstock in tissue culture, they get a source of “clean” plant material and put it into tissue culture. Pretransplant: this involves new growth medium that promotes root growth. At this time we also ‘harden’ the plants to prepare them for it’s external natural environment. Finally the plants are transferred to the greenhouse in potting soil or soilless media. As the plants grow in the greenhouse they are transferred again to individual pots were they are grown out. Once the plants are grown out to 18 inches tall, they are ready for delivery. Yesterday, Phytelligence was pleased to announce the official appointment of our CEO, Ken Hunt, COO, Tyler Spurgeon and CRO, Tim O’Brien. We’re looking forward to a year of forward progress with our seasoned agricultural executive team. SEATTLE, Wash. – March 3, 2016 – Phytelligence, a platform agricultural biotechnology company that is revolutionizing the way food crops are grown, today announced the addition of key executive team members to its growing roster. Ken Hunt, named as chief executive officer, Tyler Spurgeon as chief operations officer and Tim O’Brien, appointed chief revenue officer bring a combined 50 years of leadership experience to the company and are key players in an aggressive plan to scale the team and increase plant production in 2016 and beyond. The three executives have a strong agricultural background and will drive the strategic direction and growth initiatives for the company moving forward. Over 23 years experience successfully leading, building, growing and managing businesses. Former CEO of ag biotechnology company Anawah, a TILLING® technology company which sold to Arcadia BioSciences, Inc. which subsequently went public in May 2015. Executive Vice President at Paradigm Genetics and member of the key executive team, later acquired by Monsanto. Consultant for many other organizations within the agriculture industry including: SoilSoup, Targeted Growth, Mendel Biotechnology and TyraTech. JD, MBA and BA from Wake Forest University. Over 13 years of agricultural greenhouse and laboratory operations oversight. Research Site Leader/Senior Biologist Dow AgroSciences. Oversaw site operations of a 15 acre research facility, including field parcel, research greenhouses, labs, and support buildings. Supervisor at Exelixis Plant Sciences research greenhouse facility. Maintained controlled environmental assets, forecasted space, coordinated projects, and led teams to provide uninterrupted production. Bachelor of Science in Biology from Linfield College. Over 15 years business development and marketing experience with a deep education in horticulture production including fruit tree sciences. Executive Vice President for a direct marketing agency. Grew billing over 400 percent during 9-year tenure. Chief Marketing Officer and Senior Expedition Leader at Rainier Mountaineering, Inc.
Masters of Science in Horticulture from Oregon State University, Bachelor of Science in Plant and Soil science from the University of Delaware. Phytelligence was founded in 2012 by Amit Dhingra PhD, a tenured Washington State University professor and chief science officer for the company. The company’s ability to help farmers grow crops faster and utilizing fewer resources was spearheaded by Dhingra, who solved a long-standing plant mortality problem for farmers and developed a genetic testing process that allows growers to obtain plants that are 100 percent genetically certified. In 2015 alone, Phytelligence reported a 5X increase in plant orders and plans to produce over 9 million plants in the next two years. Washington State University researchers-turned-entrepreneurs have developed a method for growing trees three times faster while conserving water and reducing the need for pesticides – and they just made their first sale. Plant scientist Amit Dhingra and five members of his research team from the WSU Department of Horticulture founded Phytelligence, the first plant-focused biotechnology startup to come out of the university. The young company recently delivered 1,000 raspberry plants to Northwest Plant Company in Lynden, Wash., and will deliver another 50,000 to the company in August. The professor took his students’ advice and enlisted the help of WSU’s Office of Commercialization. In addition to ensuring that the technology developed by Dhingra and his team was protected, the office connected them with an expert to help draft a business plan, introduced them to potential investors and presented them with opportunities to showcase their products and services at technology events. Working out of the Phytelligence lab in Pullman, Dhingra and his partners coax tiny fragments of plants into a five-week multiplication schedule. In one year, the method can produce 250,000 plants from a single plant. Traditional propagation techniques produce around 10 plants in the same amount of time. “It can take 15 to 20 years to develop a new plant variety and then another 10 to 15 to deploy it on a large scale,” said Dhingra, adding that when commercial growers place orders, they sometimes have to wait as long as seven years for trees to be propagated and delivered. Phytelligence’s propagation method begins when researchers “plant” pieces of plant tissue in small, sterile jars containing a proprietary agar-based growing medium. At the end of each growth period, the plants, which have been housed in ideal conditions, are divided among containers with a new mix of nutrients customized for the next stage of growth. The Phytelligence solution eliminates challenges that growers face; for example, it is not uncommon for specimens to arrive damaged or stressed. Losses can be as high as 50 percent, according to Dhingra. And growers sometimes receive a different plant variety than they ordered through simple human error. They might not even realize it until years later. The method is also resource-efficient. While the plants are multiplying, they need very little water compared to soil-grown plants. Additionally, unlike plants grown in soil, those grown in sterile containers require no pesticides, fungicides or insecticides. While Dhingra and his partners are working on propagating the plants required to fill orders through 2016, they are developing a plan for the next stage of Phytelligence’s growth – licensing their growing media and technology. They also offer genetic analysis. Since the company was formed in 2012, it has created three full- and six part-time positions as well as numerous internship opportunities for WSU students. Both their offerings and their relationship with the state’s land-grant university have encouraged major support from Washington’s agriculture industry, with 70 percent of startup funding coming from growers and nurseries. It’s an exciting time for the business partners. “I grew up on a family farm in Montana growing wheat and barley, so being able to help the ag industry by getting more plants to nurseries is really exciting to me,” said Phytelligence cofounder Tyson Koepke, who received his doctorate in molecular plant science from WSU in 2012. Cofounder Kathie Nicholson is splitting her time between Phytelligence and her doctoral degree in horticulture with a focus on viticulture. She has been surprised by her interest in the business side of Phytelligence operations. “It’s really exciting to see the things we’ve done in the lab actually being put to commercial use in Washington’s fruit industry and, hopefully, farther,” she said. View Amit Dhingra’s TEDx talk at – http://youtube.com/watch?v=axqHQAtlLIA. To learn more about Phytelligence, visit http://phytelligence.com. Head of the horticultural genomics laboratory at WSU in Pullman, the Indian American botanist said that a constant complaint he hears from local farmers and nurseries in Washington state is the financial disaster that ensues when they find out, sometimes years after planting, that the rootstocks they ordered were not what they thought. Growers have to rip out rows and rows of fruit trees and start over from scratch, losing millions of dollars in the process. One rootstock starter normally produces 10-20 plants. What if one could prevent mix-ups by testing the DNA of each plant before delivery, and in addition, through a soil-free multiplication system called tissue culture, multiply the number of plants produced and cut the time period for their growth? “When I joined WSU, there was little gene-based information on apples, pears and cherries, so I initially mapped the entire DNA, or genome, of apples, pears and cherries,” Dhingra told the Capital Press of Pullman recently. He said he led the U.S. research on apples in collaboration with Italian scientists and the results were published in 2010. In June 2013, he released the genomes of Golden Delicious apples, Comice pears, Stella sweet cherries and one bitter and one sweet almond, the Capital Press reported. Meanwhile, Dhingra was also working to develop a process to increase the numbers of more robust fruit trees able to be grown in a shorter time. That’s just what he did; so with some of his graduate students as co-owners and with a license from WSU with full disclosure in place, he founded Phytelligence, which does DNA testing to guarantee authenticity of fruit trees supplied to nurseries and farmers, and supplies more plants cheaper and farther along in the growth process than through traditional methods. The process uses small pieces of plant, called explants, which are developed soil free in Petri dishes in “clean containers” supported by a proprietary mix of nutrients and artificial light. “We don’t use pesticides, fungicides or insecticides,” he added. No fruit varieties are genetically engineered, Dhingra told India-West. The fruit trees, he said, are “genetically tested to make sure they are true to type, to provide peace of mind (to nurseries and farmers). They are certain to thrive and produce fruit, and for every tree produced, they save up to 50-80 gallons of clean water. For every million trees, up to 80 million gallons of water” are saved — enough to supply the San Francisco Bay Area’s water needs for one year, he told the TED audience. Phytelligence’s methods, Dhingra told India-West, have applications for reforestation, citrus and nut productions, winemaking and bio-fuel crops. 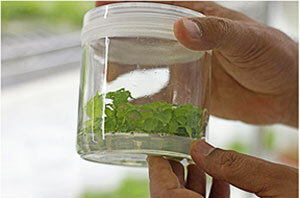 Through tissue culture, Phytelligence has the potential to make up to several million plants a year. “Every million additional trees can sequester the (amount of) carbon dioxide released by 100,000 cars,” Dhingra pointed out at the TED forum. Phytelligence produced about 50,000 plants over the last year and expects to produce about 450,000 in 2015, with a target of 1.6 million in 2016. “We are also developing a licensing model to train people how to do this,” he said. Six of the largest fruit nursery and growers in Washington, Oregon and California have invested in an “A” round of funding in the company. The Indian American associate professor has a bachelor’s in science from Delhi University, an M.S. in botany from Agra University and a Ph.D. in plant molecular biology that he began at the University of Delhi and finished at Rutgers University in 2000, along the way receiving a fellowship from the Rockefeller Foundation. He worked at Rutgers and in research at the University of Florida and the University of Central Florida, before becoming an assistant professor at WSU in 2006. His parents wanted him to be a doctor, but by the 8th grade in India he was determined to pursue the field of botany. “Plants are the reason why life exists on this planet. They give us oxygen to breathe,” he told the Capital Press. His wife, Deepika, who has a doctorate in plant molecular biology, works in the WSU genomics lab that her husband heads. They have a ten-year-old daughter.